Edo State Governor, Mr. Godwin Obaseki (left); Chinese Ambassador to Nigeria, Dr. Zhou Pingjian (2nd right); and other members of the Chinese delegation, during a courtesy visit to the governor, at Government House, in Benin City. The growing confidence among investors to set up in Edo State, has been attributed to the ongoing reforms in the various aspects of the Edo State economy, initiated by Governor Godwin Obaseki. Investors say the positive disposition of the Obaseki administration to a market-driven economy and the institutionalisation of the reforms, namely; the Private Property Protection Law that has eliminated man-made encumbrances to access land, amongst other initiatives, attracted them to the state. The Chinese Ambassador to Nigeria, Dr. Zhou Pingjian, who was in Benin City recently, said that the feedbacks from Chinese companies that have set up in the state, indicate that the state is on an aggressive drive for investment and is committed to fine tuning her laws and policies where necessary, to achieve her goal. The Chinese Ambassador assured of his home country’s commitment to boost her relationship with Edo State and extend the friendship to the education sector. Partners of the Edo Development and Property Agency (EDPA) in the development of the 1,800 Emotan Garden in Edo State, MIXTA Africa, said that the major elements for big ticket investment in housing development are present in Edo State at the moment. L-R: Edo State Governor, Mr. Godwin Obaseki; Vice President, Prof. Yemi Osinbajo; Deputy Governor, Rt. Hon. Philip Shaibu; and Executive Chairman, Edo Development and Property Agency (EDPA), Ms Isoken Omo, during the ground-breaking ceremony of the 1800 housing-unit Emotan Gardens project in Ikpoba-Okha Local Government Area, Edo State, on Thursday, June 14, 2018. Edo State Government sealed a deal for the construction of 1,800-unit Emotan housing project in Benin City with MIXTA Africa, which marks the first housing project by the state government in 16 years. 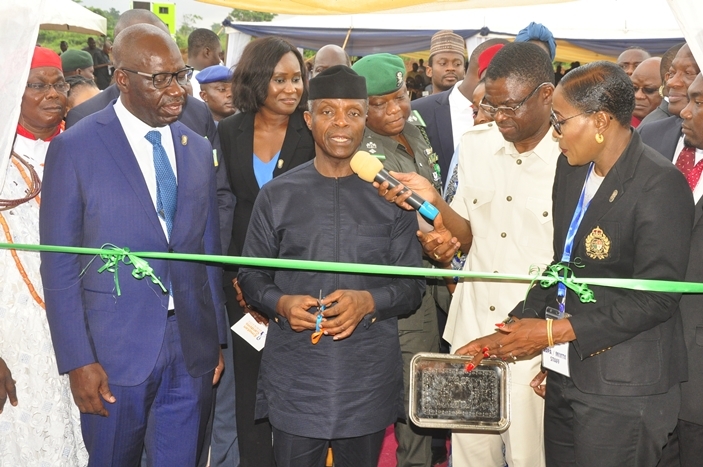 The gound-breaking ceremony for the affordable housing was performed by Vice President, Prof. Yemi Osinbajo. Edo State is home to ceramic, steel and other companies owned by Chinese investors. The state’s ambitious projects such as the Benin River Port in Gelegele, an auto assembly plant and the Benin Industrial Park are being driven by the Chinese.